Sun and clouds mixed. High 76F. Winds E at 15 to 25 mph..
Tehachapi High School is shown here in a file photo, taken in 2017. New education opportunities are emerging as Tehachapi High School joins other rural communities by assisting students to complete college credits while earning their high school diploma. It's also known as the early college model. “It’s amazing. It’s the best of both worlds,” said Lisa Stephens, director of East Kern for Cerro Coso Community College. She added, “The different concurrent enrollment classes next year will be offered earlier during the day, verus at night after high school." 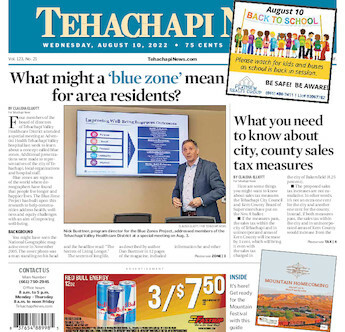 The Tehachapi Unified School District is partnering with Cerro Coso to speed up college and high school graduation rates and student success. College classes can now be less expensive, graduation requirements are met faster and students can be ready for the workplace once they graduate. “The goal for next year is to get 25 juniors and seniors into early college and give students as many opportunities as possible,” said Scott Heitman, principal at Tehachapi High School. He added that half of the day, students will be on high school grounds and the other half meet at the Cerro Coso location for college concurrent courses. This is stage one toward more opportunities for students. Students are able to take any college class they choose at Cerro Coso, although English, political science and art classes are recommended. This allows after school curricular activities if students wish to participate. Students pay $1 for an enrollment fee, although that can be waived for classes, said Stephens. Many other classes at the high school can count as college credits, if students wish to enroll. Dual enrollment classes taught by educators who have a master’s degree in the subject are offered when students are on high school grounds. Advanced Placement classes allow students to take a test to qualify for college credits. However, it depends on the college if they will accept the credits. This year the district is paying for students to take the tests, which usually cost $100 per test, said Heitman. Leaders and other institutions in Kern County are reaching out to help students earn college credit at their high school. Bakersfield College, a sister college of Cerro Coso, helped implement early college at McFarland High School in February, allowing incoming freshmen to earn associate degrees and certificates by the time they walked across the stage at their high school graduation. “Our problem for rural areas in Kern County, is that there is 9 percent college or program completion rate,” said Jean Fuller, a senator emeritus who is working on the Early College Initiative. School district’s need to approve the memorandum of understanding with an accredited college, meet with the community, and determine pathways or classes that count as college credit, added Fuller. Bakersfield College helped graduate 38 early college high school seniors from the Wonderful Academy in 2018, with an associate degree in agriculture business and prepare students for a career once they graduated, said Liz Rozell, interim vice president of instruction at Bakersfield College. She added, “It effects the economics of the whole community, and that’s why we are devoted to bringing in early college."